Support your future kindergartners by helping them read 1,000 books! Reading high-quality books at home is one of the best ways to get your child ready for school. Reading 1,000 books sounds like a lot; but if you read just 3 picture books with your child every day, you will read over 1,000 books in a year! 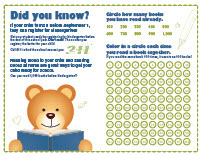 Stop by your local WCCLS library and pick up a reading log. Keep track of the books you read at home. Every time you read 100 books (and fill up the log), do something fun together to celebrate. You can even visit your local WCCLS library and ask for a 1,000 Books before Kindergarten sticker! 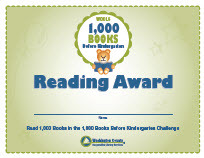 Download and print a 1,000 Books before Kindergarten certificate. It’s okay if you read the same book 100 times! Rereading old favorites helps brains grow. Reading a book your child already knows strengthens connections in the brain, ensuring those connections stay put as your child continues to learn new things. Looking for some good books to start with? Download the 1,000 Books before Kindergarten booklist. If your child turns 5 before September 1, they can register for Kindergarten! Get your student ready by registering for Kindergarten before the end of this school year. Don’t wait! The sooner you register, the better for your child. Call 211 to find the school nearest you. We are proud to partner with organizations around the county that help families with young children get ready for school. Follow the links below on more information about the services our Early Learning Washington County partners provide. Parenting Together Washington County: strives to bring families and communities together. We promote and support opportunities to learn from each other in parenting education classes, workshops and family-friendly activities. 211info: a free resource referral agency that helps connect individuals and families to health, social, parenting, and community resources and services. Call, text, email, visit the website, or use our app to connect! Early Learning Family Resource Managers: each school district has at least one Family Resource Manager who works with families that have children ages 0-6. They can help you access basic resources in the community and are dedicated to promoting early literacy and school readiness. Washington County Public Health Maternal & Child Health Field Nursing Team: The Maternal and Child Health (MCH) Field Team has experienced nurses and community health workers who make home visits to pregnant women and families with newborn babies and young children. We provide help and education, address medical concerns, and help with care coordination. For a list of services and eligibility requirements, please see our website or contact us by calling (503) 846-4872 or by emailing mchft@co.washington.or.us. Providence Children’s Health: a leader in caring for children – especially those with special health care needs. Tens of thousands of children in Oregon and Southwest Washington are served each year through Providence’s clinics, hospitals and health plans. Education and family support helps every child reach their full potential. 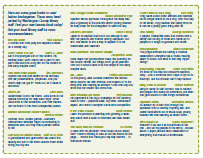 Health Share of Oregon: a local organization that coordinates health care services for Oregon Health Plan (OHP) members in Clackamas, Multnomah and Washington Counties. Kids with OHP coverage have access to no-cost medical, dental, mental health and some vision coverage. Through Health Share, members have access to the Oregon Health Plan’s largest network of health plans, doctors, counselors, dentists and more! Oregon Child Development Coalition Head Start: OCDC has many programs, and they work together to help young children and their families grow, learn, and succeed. Many of our services support migrant and seasonal farm workers and their young children. Other programs are open to families living at or below the federal poverty level. Our child care and early education programs serve infants through five year olds, and our parent programs are open to all parents that have children enrolled in our programs.